It's been more than month ... the time has finally arrived ... here's StoPani! Chapter 9! [Insert Evil Laugh]. 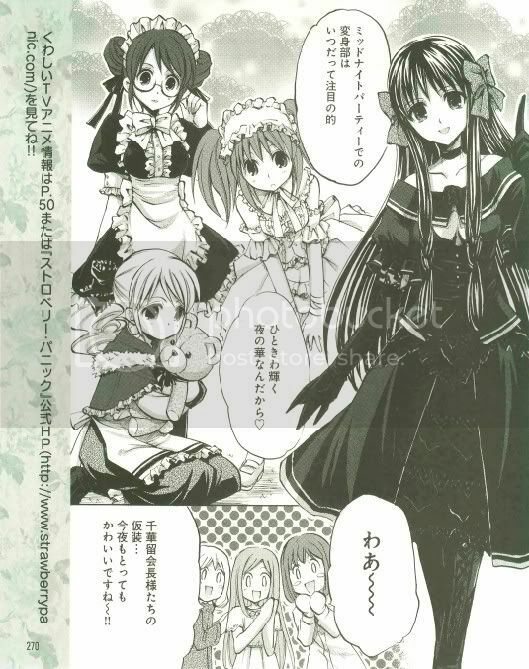 Chikaru went into 'fufufu' mode and she introduced the daring and revealing design of hers Kizuna was wearing lol. Kizuna asked Chikaru if it's alright of them to do this kind of thing? Besides the students from the other schools were high from partying before the Etoile Battle night. Chikaru replied, that she's looking forward to this year Etoile Battle because St Spica's Prince, Amane's participating. Kizuna went 'Ah, Chikaru Onee-sama mentioned Amane again, I knew it, you like Amane right?' [LoL.] 'Why don't Chikaru Onee-sama and Amane join the Etoile Battle togther? ', Kizuna suggested. Chikaru just smiled and looked on, in her mind she's thinking that it's not a Prince that she's pinning for but a princess ... no, or should she say the cute little sisters in front of her =). Chikaru continued that she has so many cute girls here and they ain't really that bad compared to St Miator or St Spica so it's time for them to step out. Kizuna and Lemon found Kagome asleep under the tree and tried to wake her up. Chikaru commented that Kagome has a cute sleeping expression =) besides it's time for Kagome's bed time. 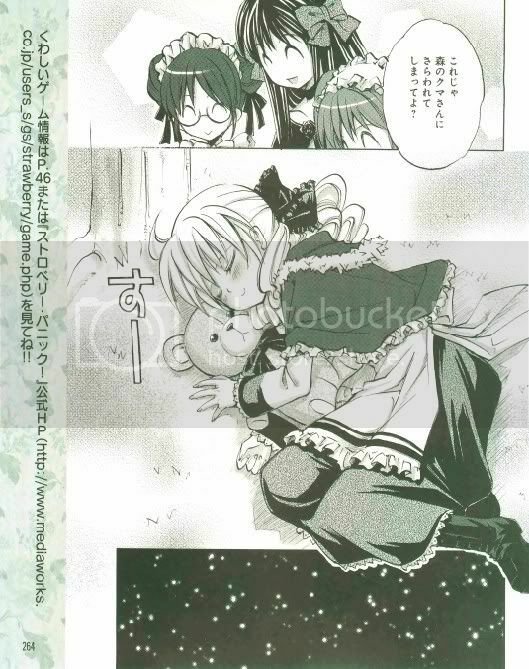 Chikaru added that if Kagome doesn't wake up, she'll get kidnapped by the big bear~ Kagome smiled in her sleep lol. [I think Kagome loves bears, with the teddy bear she's holding every where she goes ... kawaii~] That morning of the Etoile Battle, Nagisa and Tamao were in the big open bath. [The same bath Rokujou and Shizuma were in in Chapter 5] Nagisa's getting jittery over the Etoile Battle, she had momentarily forgotten about it when she was with Shizuma last night but the fears came back this morning and her limbs were shaking. 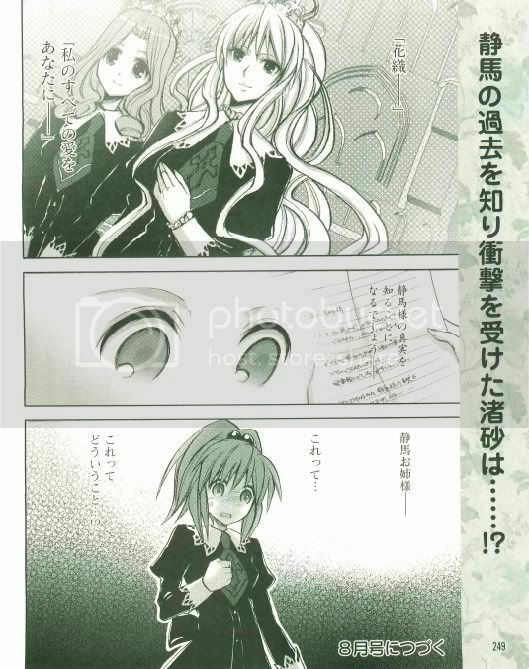 Tamao walked over and comforted Nagisa, saying she'll support Nagisa no matter what even though she doesn’t want Nagisa to be paired up with Shizuma. [=O Tamao spoke!] 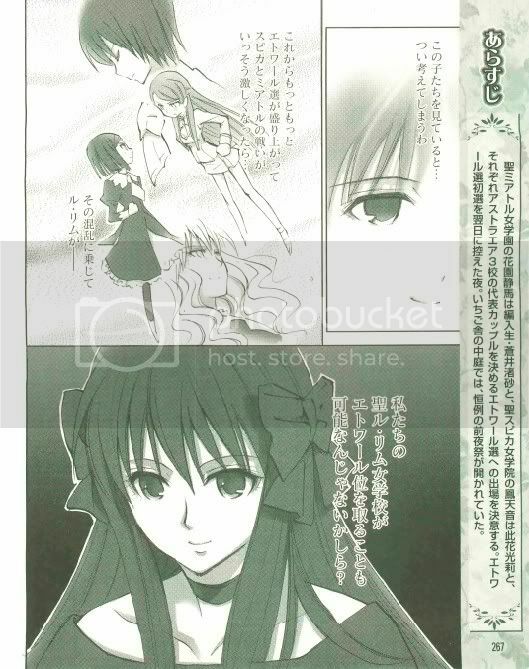 Tamao added that she’s a St Miator student afterall, so she’ll definitely support the St Miator couple. Nagisa smiled awkwardly and said she'll try her best. 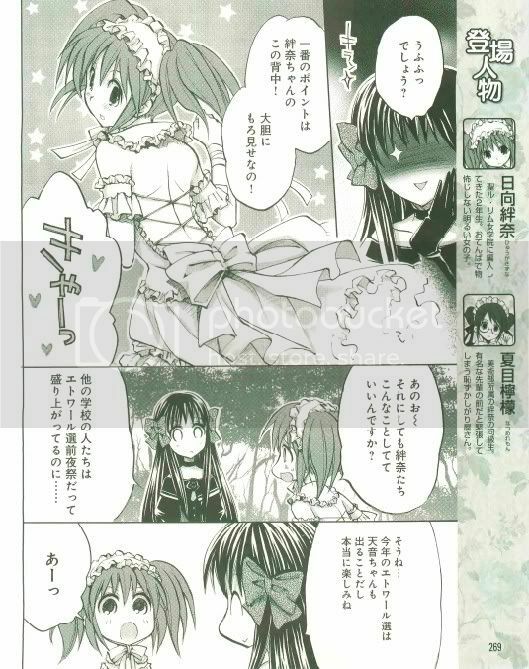 Tamao, staring at Nagisa's back so conveniently in front of her, began to chuckle and kissed Nagisa's back. [GASP!] 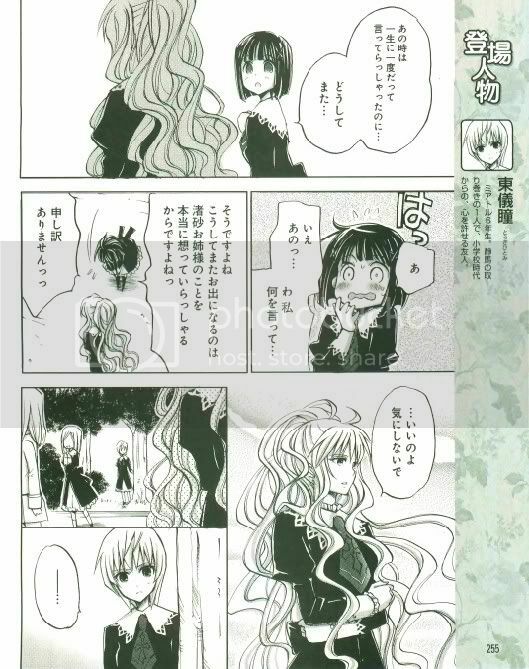 Tamao proceed on to asking Nagisa if she want a 'Calming Spell'? Fufufufu [LOL!] Nagisa thought, 'Spell?, I have a bad feeling about this ...', excused herself and ran off lol. 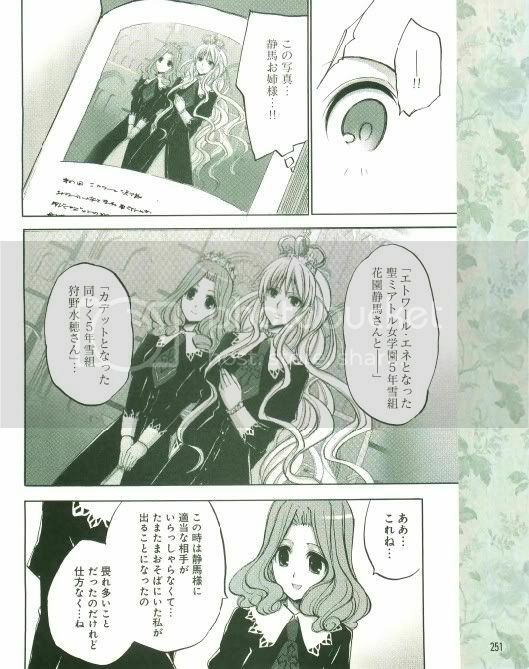 [Poor Tamao~] However, Nagisa's grateful to Tamao because she felt more relax now. 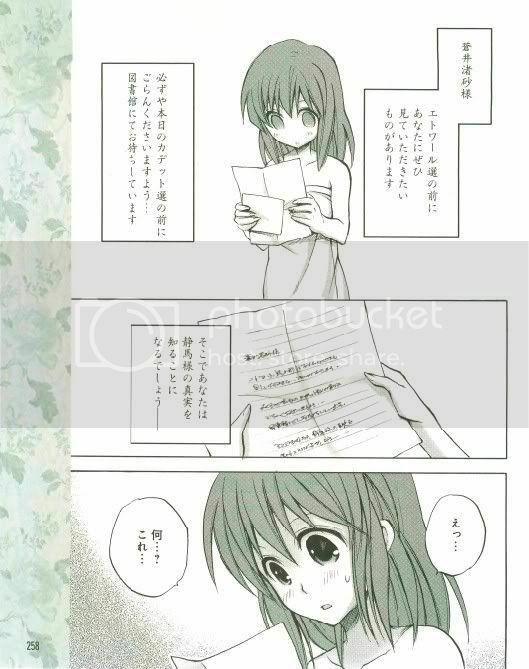 Reaching for her clothes, Nagisa found a letter among her clothes. The letter said that there's something Nagisa should know about, so please wait for the writer of the letter at the library before the Etoile Battle. Do you know the past of Shizuma? the letter ended. 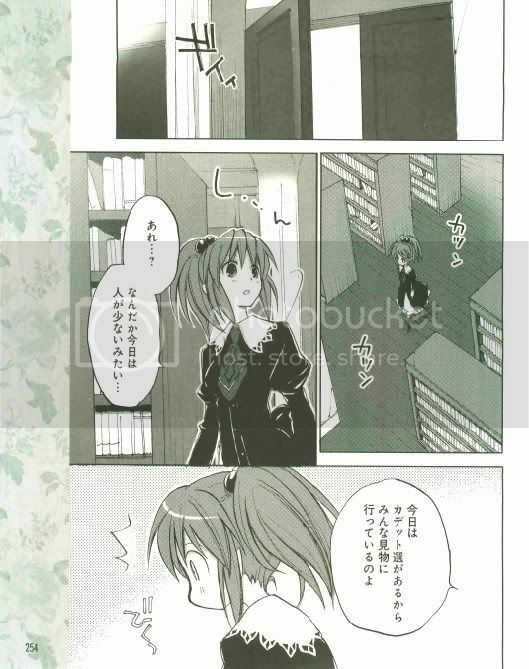 Meanwhile, Nagisa arrived at the library and the whole place was quiet. 'They were all at the Etoile Battle gathering. ', someone replied. 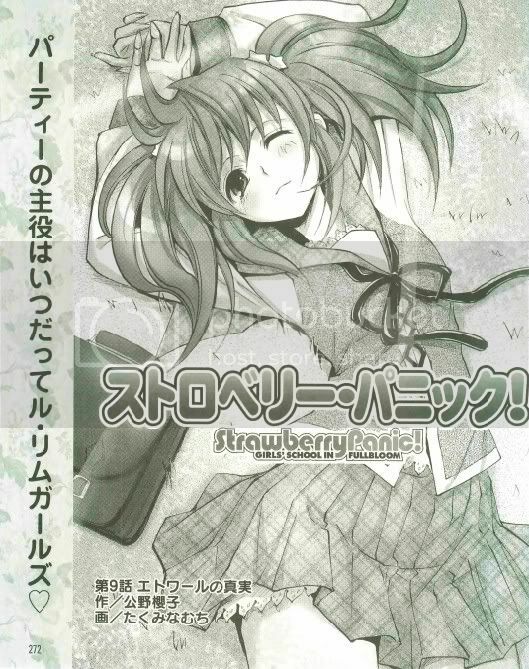 That girl's Kanou Mizuho, she's currently on duty in the library. Nagisa asked Mizuho if someone's looking for her and stated her name. Mizuho seemed surprised that she's the Aoi Nagisa. 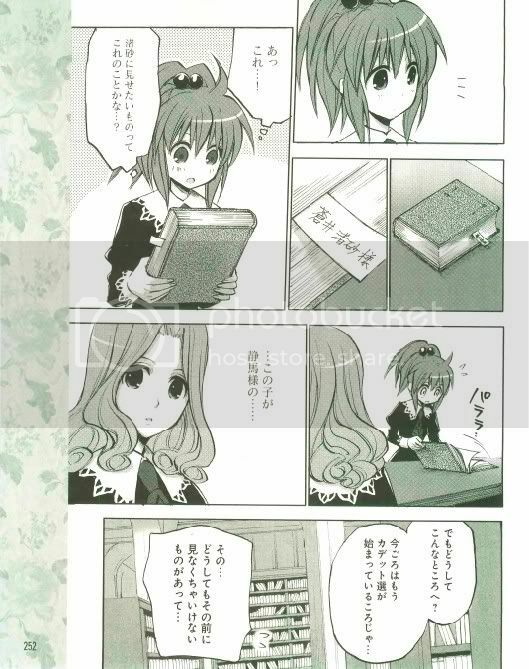 Nagisa noticed a slip of paper with her name on it slotted in a book. She flipped open the book. 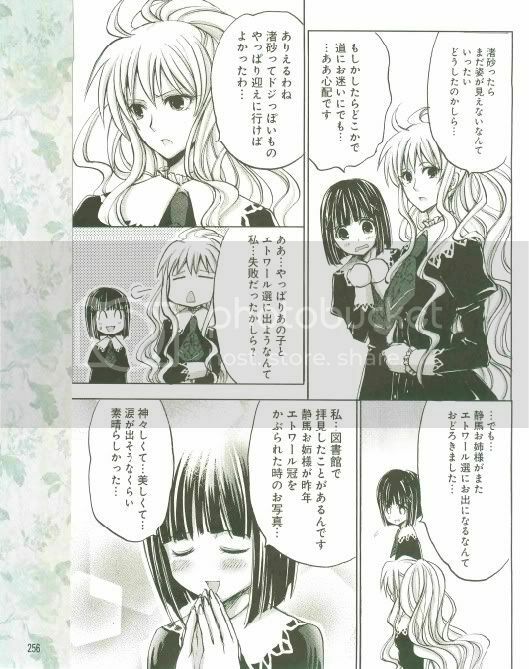 Mizuho thought to herself, so, this is Shizuma's ... Mizuho asked Nagisa why isn't she at the Etoile Battle gathering? Nagisa replied that she had something she just had to look at. * 'Ene', in Katakana, I don't understand what it means ... -.-||| it's in French isn't it? Anyone who understands French, please tell me what is it then I'll update. ** 'Kadeshito', in Katakana, similarly, I don't understand as well lol, I tried searching for the meaning, but failed, it's in Japanese after all. Update on 28th July 2006 : Thanks to Rin, click here. He/she explained that the titles for the Etoile pair in the manga, the Older is 'Aînée' and the Younger is 'Cadette'. 'Aînée' is French for 'Older' when referring to someone's sister. 'Cadette' is, likewise, French for 'Younger' when referring to someone's sister. Ahh, now it makes sense haha. Update: Ok, I started searching the meaning of 'Ene' from a English to French online translator, it gives me no meaning lol. With the help of anonymous, I tried searching for 'Older Star', 'Une etoile plus ancienne' came out. Since Shizuma is 'Older', I tried with 'Younger Star' = 'Une plus jeune étoile'. Then I figured, maybe the 'Une' and 'Ene' are the same so I keyed in 'Une' then 'Une' = One. So I tried 'Two' = 'Deux' and 'Three' = 'Trois'. Not wanting to give up, I keyed in 'First' = 'Premiere' and 'Second' = 'Deuxieme' ... From what I can safely assume, 'Ene' or more correctly 'Une' might mean 'Older/One'. I'm still curious what could 'Kadeshito' in Katakana stands for ... the Younger? the Second? I dunno ... haha. Other crazy keywords I tried, 'Husband' = 'Mari', 'Wife' = 'Epouse', 'King' = 'Roi', 'Queen' = 'Reine', 'Emperor,' = 'Empereur', 'Empress' = 'Impératrice', 'Moon' = 'Lune', 'Sun' = 'Le soleil', 'Partner' = 'Associe', 'Spouse' = 'Conjoint'. Thinking back ... it was funny haha. It's the same with Etoile, in Japanese it's 'Etowaru' but it's 'EtoILE' in French ... oh btw, 'Etoile' means 'Star' in French =). Hope you enjoyed Chapter 9, I did, because will Nagisa return to the Etoile Battle with Shizuma after she learnt the past of Shizuma? Nagisa must be thinking, 'I'm just one of Shizuma's replacement dolls right? The one she loves is not me ...' The plot thickens, will St Lulim take the Etoile title as St Miator and St Spica bickering with each other and underestimating the underdog? Go Chikaru-sama! =X. Hm, i just typed out the exact katakana in the page ... so it's doubtful that there's an exact 'Ene' in french, maybe anything that sounds like 'Ene'? ... Anyways, it's not that important, i'm just curious to know what it means haha. Thanks for your help =). Well, I'm french and we don't have any " Ene " in our vocabulary. Maybe this is not linked to the french ? I remind of " Hene " which is a kind of tatoo style, but obviously this is not the point here.. ahh maybe I have it ! You wanted to say " Aîné ", which means " older " in french. " L'aîné " is the first child of a family. It's Ainee. Ainee and Cadette.